Driving home to northeast Salem one evening I spotted a sign for Gamberetti's. I was interested because the tag line says, "fresh, local, authentic". My family and I stopped in one summer evening and I am happy to report that Salem has another Italian dining option. First, you have to find Gamberetti's. It is located on Fairgrounds Road. Not a main drive for many, but it is really worth the effort. We were greeted by a friendly server, who seated us immediately, gave us menus and gave our son crayons and a kid's menu. In looking at the menu, I was struck at how affordable Gamberetti's was. They have a varied menu, the most expensive item is $15.95, with the majority of the items in the $8-$11 range. The menu is broken down by appetizers, salads, sandwiches, pastas, and specials of the house. They also have a nice wine list, with a variety of choices to go with any meals. We were hungry and wanted to try a variety of options, so we started with an appetizer of Parmigiana Garlic Bread and the Caprese Salad. I think that the success of an Italian restaurant lies in the red sauce. Generally, if you have a good red sauce you have a good thing going. The red sauce at Gamberetti's is really good. A perfect blend of tomatoes, onions, garlic and basil. 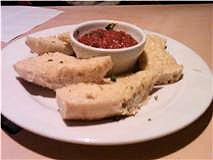 When we received our Garlic Bread appetizer, we got a big cup of it! The bread was a puffy, Como type, broiled with bits of Parmesan cheese on top. We all enjoyed this appetizer. It was hot, tasty and satisfying. 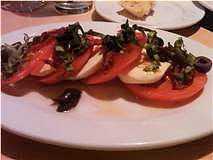 The Caprese Salad that we ordered was also good. The tomatoes were cut generously, layered with mozarrella and drenched in balsamic vinegar and olive oil. There was a chiffanade of basil, kalamata olives and sun dried tomatoes on top. It was a complete dish and we were all happy to share. 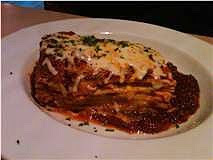 For the main courses, my husband had meat lasagna, I had spaghetti and meatballs and my son had the kids mac and cheese. The lasagna was served with meat sauce, mushrooms and was such a large portion we took half of it home. My husband pronounced it "very good". The spaghetti and meatballs was a mound of spaghetti topped with the yummy red sauce and three good-sized meatballs. I enjoyed the meal, and ended up taking half of it home. It was a nice lunch the next day. The kids mac and cheese was yummy. By the time our kiddo got his mac and cheese, he had eaten so much of the garlic bread and caprese salad, he was not very interested in it. The next time we visit Gamberetti's, we will probably skip the kid's meal and just have him share with us. We were too full for dessert, but if we had been interested, Gamberetti's had four options to choose from, including Tiramisu. They looked good, but we just couldn't. In the end, we had an enjoyable, affordable, Italian meal., or should I say, two meals. We took huge to go boxes home and we all had lunch the next day. I look forward to trying the other options that Gamberetti's has to offer. Agreed - this place is really good. My wife and I went there a few weeks ago and really enjoyed it. I will have to agree, my wife and I went there a few weeks ago. Aside from a bit of a wait to get a seat when a lot were available. (They were left short handed that night)The food was great. This is Salem's newest addition to its restaurant scene. My first (among many to come) experience here was fantastic. If the building isn't new, it's a top to bottom remodel. The décor is tasteful and welcoming. My server was a sprightly, efficient and capable young lady named Torri who made sure my bread basket was never empty except by design. I had "Pesto Pollo" which was chicken, garlic, artichokes and tomato in pine nut & fresh basil pesto over linguini all dusted with Parmesan cheese. Incredible! It was a lunch visit, so I didn't view their wine list. But judging from everything else I observed, I'll bet it's a good one. I hope this place enjoys the patronage a first look suggests it deserves. Is this a good place to take a 2 month old? We dined with our 5yr old and felt comfortable having him there. I would say that yes, this is a good place to bring a little one. Tasty food and a very nice waiter. Highly recommend. This is the kind of Italian place Salem has been missing. We will definitely be going again. another fabulous dinner! try the grilled vegetable antipasto platter and the fra diavlo ravioli- shrrimp and lobster and a sauce with just enough heat. great service, great restaurant that is locally owned and serving locally grown food. so glad to have a choice for italian that offers inspired dishes. This place is great. The food is tastier than other Italian restaurants in it's price range in Salem. The wait staff is accommodating. Forget the slop that is the Olive Garden and check out this local joint that attempts to use local ingredients. 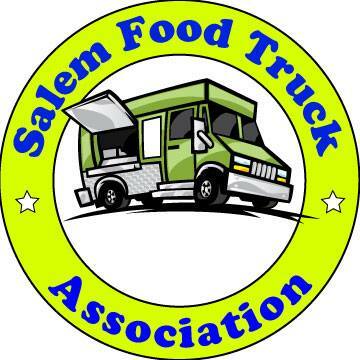 I just went onto the website you mentioned but found it very confusing and out-of-date in terms of their list of Salem restaurants. I tried to e-mail them offering a list of the closed places but kept getting an error message. Have you had luck contacting them? BTW, the "Coupons" section of this blog also has a coupon for Gamberetti's---a free appetizer I believe is the current offer. Sorry to take so long to answer. I just now checked "restauntants.com" and to the right there is a space that says something like "save now". I clicked on it and just typed in my zip code in the appropriate space and it worked. Gamberettis was the first one up. You have to buy the coupon on line. The one I got I paid 3 dollars for a 25 dollar coupon. You do have to spend at least 35 dollars at the restaurant, but it was still a savings of 22 dollars. I have had other friends who have used this sight and it worked fine. Hope this helps! With our favorite local eatery closed on the day we had a birthday to celebrate, we decided to keep our money local and try Gamberetti's for dinner, after hearing such good reports. Overall it was a good experience. It wasnt very busy here on a Monday night, and though the decor still looks similar to the previously occupying Mexican restaurant, the color scheme is much more subdued and pleasant. Our server was pleasant as well, and listed the evening's drink special for us. When he could explain all but one ingredient in the cocktail, we opted for waters. He promptly brought them and a basket of crusty, warm soft bread for us to enjoy with the oil and vinegar on our table. My companion's salad was delivered first, and though I didnt taste it, it looked plentiful, fresh and interesting -- baby greens and a sprinkling of feta perhaps. Our entrees came just after that. It kind of bothers me when someone other than our server brings our food, then we have to dictate whose food is whose... I know this is common practice, but something I expect more from a chain restaurant. I took a bite of my dish (chicken and sundried tomatoes in a cream sauce) and thought.... mmm, butter. I love butter as much or maybe more than most people but this dish was kind of single-noted and really needed something to balance it out. It was very rich; just the right amount of creamy buttery sauce, pasta cooked perfectly and there was plenty of chicken in the dish, white and dark meat. It just really needed a squeeze of lemon or some hot pepper flakes or both -- something, for balance. I would have asked our server for some if we ever saw him, but he didnt return until we were all halfway through our meals. I was by then resigned to eating it, and sprinkling some of our table's balsalmic vinegar over it helped a lot, though turned it an odd color. Mine was the least exciting dish at the table however. I grew up spoiled on my mom's homemade lasagna so I dont order it from restaurants, but my companion did. She commented more than once how fresh and tasty the red sauce was, and offered me a taste. I took a bite right out of the middle, and I confess I wanted to see if it was cold in the center from being nuked or not. It was delicious and piping hot all the way through. Our other companion had a baked sausage, penne and red sauce dish and loved it, and after finishing declared it the perfect portion size. Half of the giant piece of lasagna was taken home for later. I ate almost all my dish so you know I didnt hate it either. Everyone decided we will be back, and I think overall their food is well executed. The prices were just what they should be -- nothing like Olive Garden's! Good prices for homemade food. This is a good spot that Salem has been missing.